Apple CEO Tim Cook has said the company acquired 15 companies in 2013, but only 10 have been revealed. Now it seems two more may have been uncovered. The Apple fan site 9to5Mac has unearthed a pile of evidence that suggests that Apple bought the mapping data company BroadMap and the location-based Evernote competitor Catch. 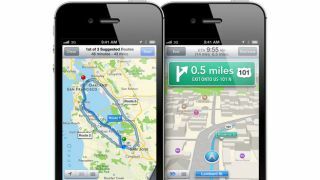 BroadMap specialized in map data processing, which Apple could conceivably use to improve its own Apple Maps app. Catch, meanwhile, was a note-taking app that could use location data to conveniently sort text and multimedia notes. But it appeared to shut its doors in August for mysterious reasons. According to a source 9to5Mac spoke with, Apple acquired BroadMap in the first half of 2013 so that Apple could mine the company for talent, not necessarily technology. And according to the LinkedIn profile of BroadMap CEO Daniel Perrone BroadMap was acquired by a "Fortune 5" company. None of the top five Fortune 500 companies in 2013 have a use for mapping tech, but Apple sits near the top of the list at number six. And several former BroadMap executives list Apple as their current employer on LinkedIn, though Perrone does not. That all points to one thing: Apple having bought BroadMap. But the case for Apple having similarly acquired Catch, on the other hand, is slightly more tenuous. Catch shut down in August after its executives decided "to take the company in a different direction." They had just launched an enterprise service called Catch Team. But Catch was promoted heavily in Apple Store locations, on Apple's website, and at Apple events. And sources reportedly told 9to5Mac that many former Catch employees, including the company's co-founder, are now at Apple working on iOS software. That's not confirmed, but it's not implausible that Apple would buy the company out apparently growing so fond of it. What might Apple do with these technologies? The former BroadMap executives' LinkedIn profiles claim they're now on Apple's maps team, so it seems their talents are being used to improve the company's oft-maligned Apple Maps. Catch might be used to improve iOS and OS X's native note-taking apps, though the location capabilities could also factor into anything from Apple Maps to Siri. What's certain is that as always, 2014 is going to be an interesting year for Apple.